FK Floor Sanding is a fully accredited, professional floor sanding and restoration company in London. We deal with every aspect of care for wooden floors. Our services extend from initial floor fitting to maintenance and restoration. We fit, clean and restore all kinds of engineered wooden surfaces, including parquet flooring, pine and hardwood floors. Our team members are all highly trained and skilled individuals. They treat our clients and their premises with respect, discretion and professionalism. They are not satisfied with a job until the client is 100% satisfied with it. To provide our clients with additional peace of mind, all our services and craftsmen are fully insured. In addition, we only use specialised, dust-free equipment. The products we utilise on floors are all high quality and low odour so that floors look their best but we don’t leave a client’s premises full of unpleasant fumes. Wherever possible we use eco-friendly products and many of the lacquers we use are water-based. Our prices are highly competitive and there are no hidden costs. After completion we provide a clear, itemised invoice. If an unexpected additional cost comes to light as our teams carry out the work, we always obtain authorisation from the client before incurring expenses. We also offer a warranty on our work; the terms are explained up front. Floor sanding is a messy, back-breaking and time consuming job. We ensure that we go through the stages of sanding so that old paint, varnish, stains, scratches and gouges are removed. We also use specialised equipment which allows us to sand floors effectively without producing any sawdust. In other words, sanding by our experts is dust-free. When we finish, floors are smooth and your premises are no longer in fine sawdust. Common causes of damage to wood floors in the UK are rising damp, wet rot, woodworm and dry rot. Our experts assess the damage to determine both the cause and the extent of the damage. They then recommend a course of action to stop the damage and provide a quote. While the client is under no obligation to have the repairs done, we strongly suggest dealing with the cause of the problem or it will become progressively worse. Potentially a wood floor can be destroyed and surrounding objects and structures may also be affected. Our craftsmen will first accurately identify the wood that has been used for the floor. Based on that information we can advise the client about staining options. Some woods do not take stain well. In addition, it is necessary to sand a floor before applying stain as stain magnifies scratches, resin drops and other imperfections in the wood. We provide the client with guidance in terms of the colour of the stain and drying or curing times. 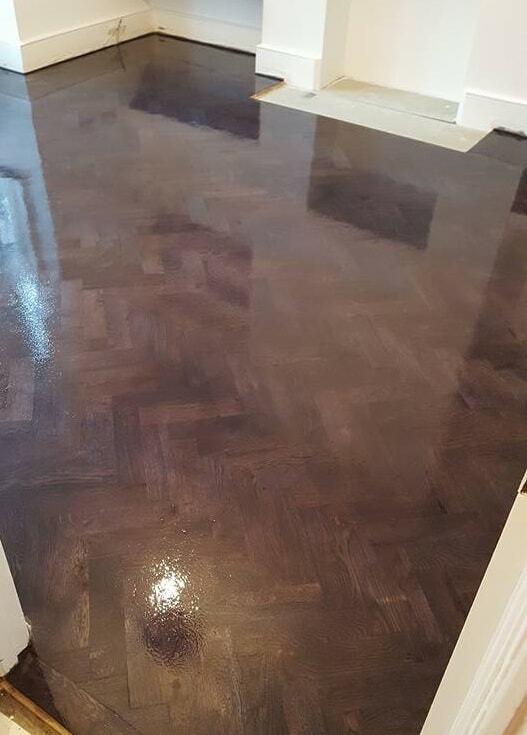 Once the client has made these decisions our experts apply the stain making sure that it goes on evenly and brings out the desired colour. Over time wooden floorboards move and shrink. As a result gaps form between the floor boards. These detract from the appearance of the floor and should be filled. Our experts assess the client’s floor and make recommendations based on the condition of the floor. We discuss various filling options with the client so that he or she can make an informed decision. Our teams then carry out the work using wood strips, resin, or acrylic filler. Our craftsmen ensure that a new floor has a clean, dry and level sub-floor. We use various specialised equipment, materials and techniques to lay flooring. Our clients can select from solid wood, laminate, engineered wood or parquet floor. Based on that choice we use the appropriate fastening method that is effective yet unobtrusive. Once a full assessment has been done we begin by cleaning and then buffing the floor. We then vacuum it to remove the dust caused by the buffing. The various stages thereafter depend on the condition of the floor and the client’s requirements. The stages may include one or more of the following: sanding, gap filling, staining and or finishing. The wood floors in offices, public buildings, gyms, dance studios etc. take a great deal of punishment. As a result they become scratched, stained and chipped quickly and require attention from experts. The sanding process is the same as for non-commercial wood floors. However, we try to schedule the sanding for times that will cause the client the least inconvenience. The solution for floors that have superficial damage thanks to everyday wear and tear is buffing followed by the application of a suitable finish. The client can select from varnish, oil or wax depending on his or her requirements. Our experts are there to offer advice. For more information about our floor sanding services in London, or to arrange a free visit, please call us on 020 3909 7641. We guarantee customer satisfaction. here is just a small selection of their words about our floor sanding services in London.